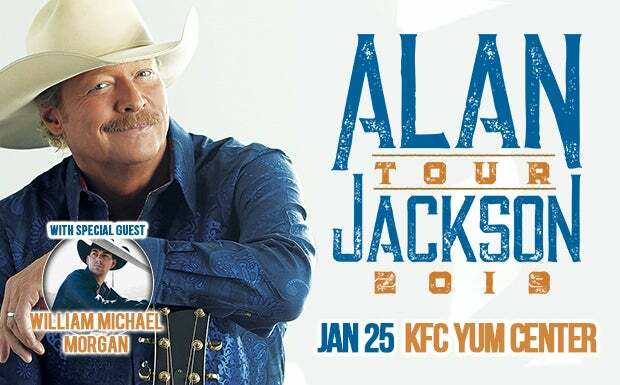 Country Music Hall of Famer Alan Jackson will bring a night of hits to Kentucky with a concert at the KFC Yum! Center in Louisville on Friday, January 25, 2019! Jackson is teaming up with CID Entertainment to offer VIP Experiences at many of his 2019 shows; fans can choose from four experiences with a variety of perks including a backstage tour, the opportunity to watch the show from a custom barstool by the soundboard, access to a pre-show party, a signed poster, and more! Alan Jackson’s concerts find the country icon performing hits that have gained him legions of longtime fans, songs that continue to draw new crowds as a younger generation discovers his music. Jackson’s repertoire stands the test of time; it has impacted a field of artists who cite Jackson as an influence. It’s these same songs – many written by Alan – that earned him his place alongside country music’s greatest names and cemented his place in its history with membership in the Country Music Hall of Fame. Fans will hear the songs they love from the man who wrote them and made them famous, including his debut hit “Here in The Real World”…signature songs such as “Chattahoochee,” “Drive” and “Gone Country”…party anthems “It’s Five O’Clock Somewhere” and “Good Time”…and many, many more. Jackson’s Louisville concert will continue his tradition of “keepin’ it country” for people far and wide as he brings nearly 30 years of hits to the Bluegrass State!